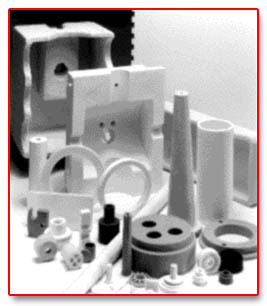 Custom Fabricated Ceramic Components from AC Technologies, Inc.
AC Technologies, Inc., an advanced ceramics company, offers "off the shelf" standard Alumina & Mullite Tubing, Machinable Ceramics & Magnesia Ceramics. Our Custom Ceramic Fabrication facilities include Design & Application Services to meet the varied needs of industry, research & academia. AC Technologies, Inc. looks forward to being your Advanced Ceramics provider. We have six grades of machinable ceramics available, each with unique features that will assist in solving your application problems. Single, Double, and Four bore tubing, plus Oval Double Bore. 998% Alumina & Mullite tubing. Prototype to Production! As the source for many advanced ceramics, AC Technologies traditionally services a market of high tech customers, including semiconductor, aerospace, medical & academic accounts. Alumina, Steatite, Magnesia, Machinables, Macor®, Zirconia & More! With numerous models to choose from, we are your leading source for After Market Replacement Parts.